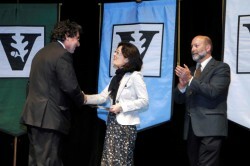 Five faculty members were recognized for their achievements in and out of the classroom by Chancellor Nicholas S. Zeppos at the Spring Faculty Assembly. Professors Paul Laibinis, Emily Nacol, Sohee Park, Suzanna Sherry and Janos Sztipanovits were selected for the awards by Zeppos out of a pool of nominees nominated by faculty. 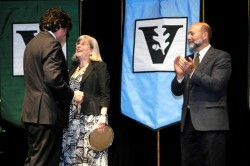 Spring Faculty Assembly took place March 29 in Langford Auditorium. 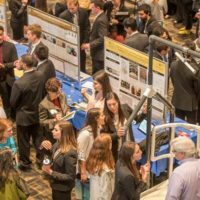 In addition to the awards, the program included an update on university affairs from Zeppos, welcoming remarks from Faculty Senate chair David Weintraub and a performance by Connie Heard and Amy Dorfman of the Blair School of Music. Sztipanovits, E. Bronson Ingram Distinguished Professor of Engineering, won the Joe B. Wyatt Distinguished University Professor Award for accomplishments that span multiple academic disciplines. Sztipanovits, a respected leader in cross-disciplinary research involving classical and engineering computation, is a leader in efforts to provide security and privacy to health care records. “His contributions to the national and international research community are determining the direction of our nation’s and world’s research efforts,” Zeppos said of Sztipanovits. 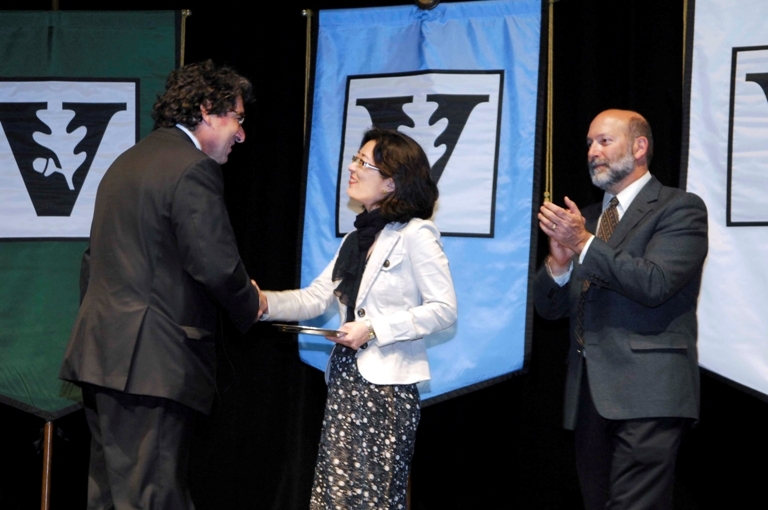 The Alexander Heard Distinguished Service Professor Award was presented to Sohee Park, Gertrude Conaway Vanderbilt Professor of Psychology, a leading specialist in the study of schizophrenia. “Among the many lessons that Sohee shares with students is a genuine and sincere concern for individuals struggling with schizophrenia and a sense of compassion for the people who love them,” Zeppos said. The Harvie Branscomb Distinguished Professor Award for creative scholarship went to Suzanna Sherry, Herman O. Loewenstein Chair in Law. she has authored numerous books and more than 70 articles and is one of the most cited members of the Vanderbilt Law School faculty,” Zeppos said. The Ellen Gregg Ingalls Award for Excellence in Classroom Teaching was presented to Paul Laibinis, professor of chemical engineering. Nominees for this prize excel in fairness of criteria for awarding grades, classroom engagement and willingness to meet students outside of the classroom. Emily Nacol, assistant professor of political science, won the Madison Sarratt Prize for Excellence in Undergraduate Teaching. “Emily has a special gift for putting students at ease and making them feel like no question is too simplistic to address,” Zeppos said. Award winners each get a $2,500 prize and either an engraved pewter cup or silver tray.